« Who Else Will Do It? 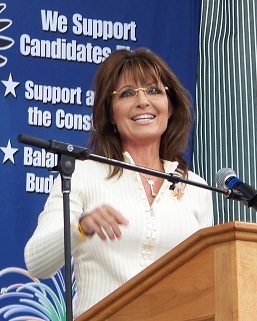 This entry was posted on Sunday, September 18th, 2011 at 16:55 and is filed under Election 2012, Politics, Sarah Palin. There’s been a good deal of talk in Palinista country about how to prepare for the day an official campaign will begin. From my point of view, I think you need to consider carefully the words of Karen Allen, the Organize4Palin national director. If you’re a Palin supporter, and you want to join our battle, please follow the link above and read the rest of the article. Make no mistake: We’re in a battle for our country. Standing on the sidelines is no longer enough. Get out there, and do the legwork on behalf of your country. Politics isn’t really a spectator sport, and as much as it is easier sometimes to let others speak on our behalf, if we’re going to win in 2012, and begin to restore our nation, it’s going to take you. Some of you have asked me why I don’t have advertising on this site: It’s because I know advertising can become annoying, but it also means that this site and its message only spreads because you put it out there. With thousands of viewers daily, you’ve done a tremendous service, but we have millions to reach. Let’s also talk to the unconverted. Let’s go out and make our arguments. That’s what my blog is all about. Preaching to the choir is always easier, because they’re inclined to listen. More difficult is the work of finding new people and new talent who just need the right bit of impetus. It’s time for we cubs to do some roaring of our own! It's great to see so much energy! on the volunteer sites. Everyone certainly has passion. Do you think it is feasiible to miss so many of the debates – I see the logic of letting the others cannibalize and self destruct but when is too late? I feel the same about others such as Chris C or Guilani jumping in after too. I know that Gov Palin is her own person and does what she wants, when she wants, but when do those in the main stream public get to hear her views? Actually Samantha, I think appearing in these debates would hurt because it makes of a candidate one of the "8 dwarves." Point is, it really doesn't matter yet. Now, on the other hand, you can hear her views by watching the speeches she's made, or reading about them on her facebook page, or any number of ways, so anybody with any actual curiosity can go find out about her policy ideas in any number of places. If I were you, I'd start with her speech from Sept 3rd in Indianola, IA. I was present. It was a great speech. It is available several places, including on this site. Samantha, I don't think you have too much longer to wait. A sports writer recently commented that Sarah was using the methods used by race car drivers. Let the rest of the pack lead, and use their energy. Then, come from behind and beat the pack. Heh,where have I heard that before? No I do not think so…people know who she is…the good due to US…the ugly due to the LSM…..I know that Oct 21 is legal day she has to reg for some states to be on the ballets….she keeps saying the end of Sept..
Do you know of any official Palin support groups in Florida? Googled it briefly and didn't come up with much. Thanks. Oh and loved that Nascar analogy you made a few posts back! Keep up the good work.